The Circular Walk in Knockreer, Killarney National Park is popular with visitors and locals alike. Situated close to the town centre, this is an ideal way to get a dose of the National Park and experience some of the wildlife up close, without having to venture too far from town. The trail loops around some of the most accessible parts of the Park and has a smooth paved path throughout. However, this is not the typical ’walk in the park’. You will be rewarded with wonderful lake and mountain views, open parkland expanses and an almost guaranteed glimpse of some of the local Red Deer herd. As the trail is well paved, it is suitable for cycling and buggies/strollers throughout, although there are a number of cattle grids to negotiate throughout so it is not fully accessible to all. There are some inclines at the start of the walk but the views from the elevated part of the trail are well worth the effort involved. The Deenagh Lodge is the natural start/finish point for most following the Circular Walk trail. This is located at the entrance to Killarney National Park directly opposite St. Mary’s Cathedral, about a ten minute walk from Killarney town centre. A cycle path and footpath along Mission road will take you directly there. Roadside parking is available on Port Road directly outside the entrance but this can be quite busy during the summer months or when services are underway in the nearby St Mary’s Cathedral. The distinctive, thatch-roofed lodge is home to a lovely coffee shop which provides refreshments during the summer months. The nearby children’s playground also makes the lodge a good place to start or finish a family outing. As you cross King’s Bridge over the Deenagh River into the Park, keep an eye out for dippers, herons, cormorants or even a stoat as they fish along the banks of the river. At dusk, you may see the bats swooping beneath the bridge to catch their supper. As you proceed through the gates, before you lies Deenagh Lodge. At this point, head on the path that rises up the hill, following the signs for Knockreer House. There are a couple of different paths here so if you’re not going uphill straight away, you need to retrace your steps back to Deenagh Lodge! There is a steady incline up towards Knockreer House and Gardens. It levels out soon enough so it’s best to get it out of the way at the start. Knockreer House is located on the site of the original Killarney House which was destroyed by fire in 1913. Knockreer house is now home to the Killarney National Park Education Centre, and some of the original walls of Killarney House can be still seen in the Gardens. As you pass by Knockreer House and continue along the Circular Walk path, keep a lookout for the red deer as they often frequent this area. The path soon opens up to the wonderful vista of Lough Leane and the McGillycuddy Reeks standing proudly behind it. It’s hard to believe that you are less than 10 minutes walk from the busy road you left behind. Look out for the Killarney Golf & Fishing Club on the lakes shore beneath you. Crossing over the first of three cattle grids on this route is the point where you would branch off to join the Fossa Way trail. The Fossa Way would bring you along to a newer path that leads to the Castlerosse Hotel, Killarney Golf Club and ends at The Europe Hotel on the main Ring of Kerry Road. This is also one of the points where the horse trail meets the circular walk path. If you haven’t already come across any deer by now, look closely around you as you head across the open parkland. If you are visiting in late September or October, this is one of the best places to observe the Red Deer rutting season in close proximity. Be very careful during rutting season and make sure to give the deer a wide berth if they come near the path. The experience can be enhanced even more by setting off at dusk. The sounds of the stags in full voice is well worth braving the Park after dark! Continue on through the second cattle grid and the Park opens up to the wide meadows which are shared by the red deer and the Kerry cows. At the third cattle grid, we reach a crossroads. Taking a left along the main path will bring us back along a gentle slope to our starting point at Deenagh Lodge. The path to the right continues on through Knockreer and will lead eventually to Ross Castle via the shores of Lough Leane. If you’re not pushed for time, the best option is to continue straight on towards the river Deenagh. You will shortly reach the river via a small bridge. Turn left to head back to the Lodge via a pleasant riverbank path. Dippers and herons are regular fishers on this river. It is not uncommon to see a cormorant drying their wings on the riverbank. Before long you will reach another more substantial bridge. Take a left over this and head up to the starting point at Deenagh Lodge. Note: If you are on foot or cycling and heading back to Killarney town, you don’t need to head back to the lodge – the riverbank path joins the path that leads directly back to Mission Road and into the town centre. It’s no surprise that this trail is such a big hit with all those who travel along its paths. The great variety of sights and terrain on this relatively short trail means that it always offers something new on each outing. The close proximity to the town, coupled with the fact that it is suitable for walkers, joggers, horses and buggy pushers alike, means that it will remain of the most popular trails in Killarney National Park. 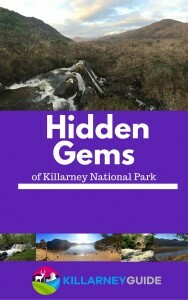 To get a FREE eBook on Killarney National Park, and to get updates from Killarney Guide, please subscribe with your email below. We are looking for a short walk near town that we would take during a 3.5 layover between busses at Killarney Bus station; have visited the town before, but have never walked outside the town. I hope this gives you some ideas – let us know if you need any further info. Enjoy your walk! A wonderful walk. Hard to believe you are in the heart of Killarney. Hi Tony, thanks for leaving a comment. Glad to hear that you enjoyed the walk. It’s a wonderful walk so close to the town centre.